Lesser quality faucets use spring loaded balls and rubber seals, nylon cartridges, washers and seats, that wear out quickly leading to drips, costly frequent service and part replacement. All faucet valves are machined with standard fitting sizes and threads which allows for more flexibility and creativity during installation. Faucets should be installed using ½” or larger diameter pipe to insure adequate flow. Many imported faucets are equipped with small diameter hoses (⅛”, ¼” and ⅜”) which greatly restrict flow rates. Finding parts for imported faucets with non standard fittings can be troublesome. The faucet finishes carry a lifetime warranty so should a problem occur with the faucet, simply call us at 800-289-8827. Warranty excludes shipping and labor costs. Call Watertech at 1- 800-289-8827 if you have installation questions or need warranty service. All products are I.A.P.M.O. and CSA BIZS listed in the USA and Canada. 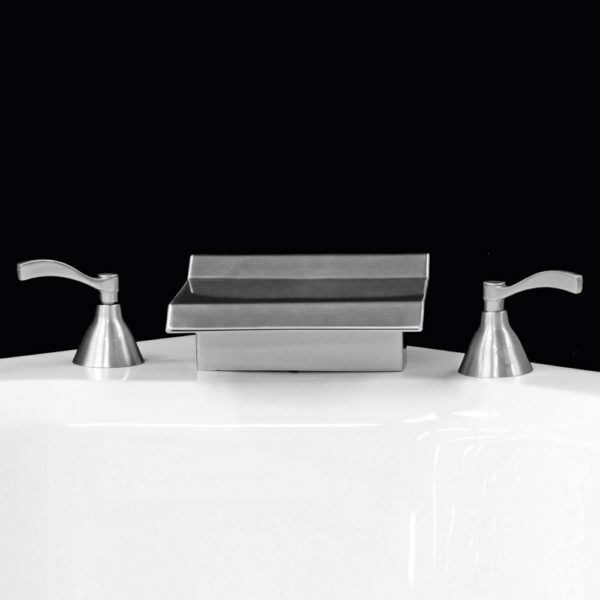 Faucets – Watertech offers a wide array of deck mounted faucets, available in chrome, nickel and oil-rubbed bronze. NEW! Cascading whirlpool faucet, overflow and drain combination. The sleek, thin design of the new faucet combines the functionality and convenience of filling and draining the bathtub through one integral unit with its patented backflow prevention technology. The filler and overflow are located inside the bathtub and eliminates the need for a spout. The all brass Cascading Whirlpool Faucet eliminates the chance of bumping your head or hitting your legs as you enter or exit the bathtub. The Cascade Whirlpool Faucet also eliminates the cost of purchasing a separate drain and overflow. Available in chrome, nickel and oil rubbed bronze finishes.